This is a valuable addition to RTÉ’s series of recordings of the Irish tradition in classical music, a series which gives the opportunity to hear music from a nation often overlooked by listeners. It needs to be said at once that the music of Frank Corcoran is rarely easy, or, in the colloquial sense, particularly rhapsodic. He does have a distinctive voice and, in some ways places himself in the Irish tradition, especially, on this release, in Duetti Irlandesi for Cello and Piano. A valuable feature of the CD is the cross-section of his music provided, from solo works up to the full orchestra of the concerto. The linking feature is the cello, but otherwise, the pieces are dissimilar. The sound world put me in mind of Elliott Carter, though the voice is not identical, and distinctly Corcoran’s own. As a composer, Corcoran has worked in various media, including electric-acoustic, but many of his works refer to Irish literature and traditions. Despite this, his teaching has been international, notably in the USA (including Harvard, Princeton and Boston) and Germany. In the 1980s he was professor of composition in Hamburg, and his first symphony (Symphonies of Symphonies of Wind Instruments) was premiered by Lothar Zagrosek in Vienna in 1981. The Cello Concerto is perhaps the most substantial work here, and it is a considerable piece. The opening movement acts as a gritty introduction to the remainder—it has a stern, rather agonised character. The cantabilissimo slow movement is characterful, with an element of slow song made up of scraps of melodic material. It has an instant attractiveness. The scherzo is described by the composer as “easily the most violent music I have ever written”. Orchestral strings are silent: the propulsion—it drives hard, very hard—comes from massed percussion and howling brass. The final movement recalls the first, reconciling, or not quite, fragments of the others, and recalling the opening of the whole concerto. James Joyce, of course, also used this circularity in Finnegan’s Wake (as would Flann O’Brien in The Third Policeman), so it is perhaps apposite that the next work on the CD is Rhapsodietta Joyceana. The composer describes Joyce as “the greatest Irish composer”, noting the effects of reading Joyce aloud. The piece is not large but it works as a tribute to the spirit of Joyce. 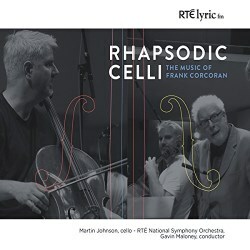 Rhapsodic Bowing for 8 Celli written specifically for the cellos of the RTÉ National Symphony Orchestra is an interesting piece which requires virtuosity. As Corcoran says: “There is … not only rhapsodic bowing but also rhapsodic plonking and plinking, pizzicati and (col legno) striking”, but matters are resolved into a strong and ultimately tender ending bases on Bach’s C Major Suite for Cello. The composer claims descent from Floirint Ó Corcorain, a master harpist of the 15th Century. Corcoran has long been fascinated by the traditional pieces. Yet he describes himself as appalled by settings of traditional melodies by composers such as Beethoven, Haydn, Britten and Harty, and attempts, in the rethinking here, to recapture the original spirit of eight traditional melodies. Many are associated with Corcoran’s home county of Tipperary. The pieces are melodic, touchingly beautiful, and suited to the melancholic tones of the cello. The original airs are treated with affection and respect for their character. There is an absence of aggressive modernism, but real affection. These eight pieces deserve frequent performance. Most familiar to many will be the final tune Róisín Dubh. It was so significant in Seán Ó Riada’s score for Míse Eire, and has much political resonance. Playing by Martin Johnson and his partners is excellent, notes (by the composer) are informative. This is a worthwhile and fascinating addition to the RTÉ series.